Martha sat underneath a tree in the playground, trying not to cry. But then a soft nose nuzzled her neck and she felt Stibler Horse’s warm mane around her shoulders. Martha couldn’t speak. ‘Not all right, then?’ said Horse. Martha’s voice trembled. ‘Not all right,’ she whispered. ‘Can’t,’ said Martha. It was true, because the lump in her throat was getting in the way of speaking. ‘No hurry,’ said Horse cheerfully. ‘Tell me when you’re ready.’ And she smiled a warm smile. ‘I’ll never ever tell,’ added Martha. There was a pause, but Martha couldn’t help a spark of interest stirring. “How have you helped people?” she asked. ‘Oh,’ said Martha. The truth was, she loved to hear horse chatting away about long ago, and she no longer felt like bursting into tears. 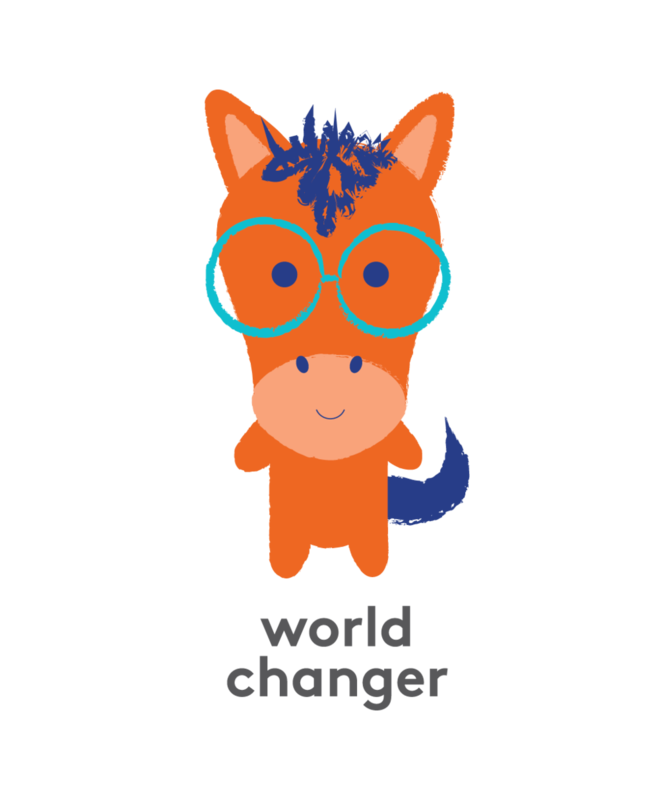 ‘Anyone can help change the world,’ announced Horse. ‘Certainly, you can,’ insisted Horse. ‘There you are then,’ said Horse. ‘I could give a friend a ride on my back?’ said Martha. ‘Yes, true, but there are other ways to change the world,’ said Horse. ‘Well yes indeed Martha,’ said Horse, impressed. ‘Miss Ajala said in our class,’ said Martha. ‘Miss Ajala sounds like a World Changer,’ said Horse. ‘Not be bossy and mean at playtime.’ This was said with some feeling. ‘Well,’ said Martha. It was surprisingly easy now to speak about her fight in the playground. Perhaps she’d go over to her friend and suggest a different game to play. Maybe she could be a world-changer too: like Horse with her horse power.